Facts about Snowshoe Cats. "Scientific name for Snowshoe Cat is Felis Catus". The Snowshoe Cat are named for their beautiful white paws which came about as a distinct breed between the American Short-hair and the Siamese cat. The Snowshoe types of cats are considered to have various personalities. Snowshoe Cats can be demanding or reserved but also affectionate and sweet. Bearing the same similarities to its ancestor, the Siamese cat, the Snowshoe Cat has a light-colored body with dark parts in blue or seal. Snowshoe Cats legs, ears, tail and a mask around it eyes are divided by an inverted white marking which is v-shaped and between Snowshoe Cats blue eyes and over its muzzle. The Snowshoe Cat has four white paws with the rear ones known as 'boots' and the front 'mittens' it has a rounder body with a much shorter hair than that of its ancestor, Siamese cat, the Snowshoe Cat is a medium sized cat which weighs 9 to 12 pounds (4 to 5.4 kg) with the females weighing 7 to 10 pounds (3.1 to 4.5 kg). A female Snowshoe Cat is always smaller than the rest of the breed. The Snowshoe Cat has a smooth short coat which is easy to care for. The Snowshoe Cat usually has its kitten born in white colored fur. However, their points develop as they grow and darken as they mature. The Snowshoe Cat usually has a light creamed fur which ranges from tan to seal to blue or beige with their paws being white and nose leather and paw pads being pink. Others Snowshoe Cat can have their nose leather and paw pads having the same color as their points or a combination of the two different colors. The Snowshoe Cats have a unique personality and are considered interesting to live with. 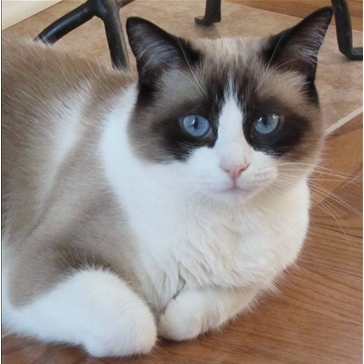 The Snowshoe Cat have large glances with large, round, walnut-shaped sparkling blue wide eyes. The Snowshoe Cats are affectionate, active and smart and can always be the needy best friend or the entertaining clown. The Snowshoe Cat are shy and can take their time warming up to strangers or visitors. The Snowshoe Cat tend to stay close to and choose their favorite person in the family. However, they maintain a cordial relationship with the rest. The Snowshoe Cat are known to perform tricks, open doors, walk on leash and enjoy dabbling in open running water. The Snowshoe Cat get along quite well with other pets including dogs. The reason why Snowshoe Cats can squeeze through very small spaces is that they have no collarbone and free-floating clavicle bones that their shoulders are attach to their forelimbs, that's why a Snowshoe Cat can fit through a hole the same size as its head and they use their whiskers to determan if they can fit through the space. The Snowshoe Cat requires to be kept indoors to protect them from diseases. Their coats require to be brushed twice a week to distribute their skin oils and remove dead hair. Daily dental hygiene is also considered. A Snowshoe Cats has 30 teeth while a kittens has about 26 teeth that they will lose at about 6 months of age. A Snowshoe Cat has the ability to jump up to six times its length. Snowshoe Cats on average sleep 13 to 14 hours a day and when they are awake, the spend a lot of time liking themselves to keep themselves clean. Snowshoe Cats help control rodents like small rats and mice where the live homes, warehouse, ect. A female Snowshoe Cat is called a "queen or molly", male Snowshoe Cat is called a "tom" and the name "clowder" is called a group and young or baby cats are called kittens. Snowshoe Cats have very sharp hearing and their sense of smell is fantastic. Snowshoe Cats average life span is around 12 to 15 years. Snowshoe Cats can see at levels of light six time lower than a human, this is why cats can catch mice so easily at night. Snowshoe Cats outer ear uses 32 muscles to control it, and a human has only 6 muscles in its ear and a cat can move its ears 180 degrees. A Snowshoe Cat can move their ears independently. The cat's hairball is called a "bezoar" (meaning a concretion or calculus found in the intestines or stomach of certain animals, in particular ruminants, formerly alleged to be an effective cure for poison). The average Snowshoe Cat temperature of a cat is 101.5 °F (38.6 cel). The Snowshoe Cats heart beats at 110 to 140 a minute, That is almost twice as fast as a human heart. A Snowshoe Cat can climb up a tree well but can not climb head first down a tree, because all the claws on a cat’s paw points the same direction, to get down from a tree, a Snowshoe Cat has to back down. A Snowshoe Cat can run at a top speed of about 30 mph (48.2 km) over a short distance. A cat rubs against a person to not only to be affectionate but also to mark out its territory. A Cat does not like water because its fur is not insulate it well when it gets wet. A Snowshoe Cat averages about 12 whiskers on both side of its face. A Snowshoe Cats jaw can not move sideways, there for a cat can not chew large pieces of food. A Snowshoe Cats back is highly flexible because of its 53 loosely fitting vertebrae. The body of a Snowshoe Cat has 230 bones. While a human body has 206. Compared to a humans who only have 34.